Handmade, fully custom F-4 Phantom Fighter Jet Canopy Rail where you can have your own name, rank and colors custom painted on. Made from 5052 series (I may substitute 3003 series) .032 thick aluminum, with hundreds of real solid aluminum rivets, (5/32″ flush rivets on flight surface & 3/16″ round rivets on the interior) with sixteen 1.5″ lightening holes. I can also vary the configuration to look like F-14, F-15, F-16, or F-18 canopy rails. 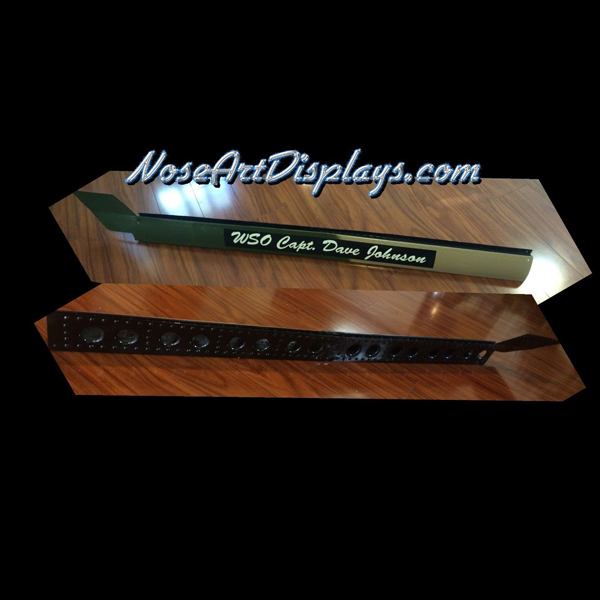 60 inches long, 3.75″ wide, 7.5″ tall at the rear canopy mount and 4.5″ tall at the rail. Made with a channel that would accept the actual canopy. Due to being a custom made project which take over 14 hours to build, it can take a few days to make before shipping. I can further customize yours. Wouldn’t your veteran relative be surprised to receive this for their wall? Remember Robert Duvall in ‘The Great Santini’ playing Lt. Col. ‘Bull’ Meechum? USAF NAVY USMC US Air National Guard Blue Angels Thunderbirds all flew what may be the loudest and meanest looking fighter jet of all time!